Born and bred in the U.S., Filipina-American Pattie Umali grew up with a “bittersweet” relationship with the Philippines—she felt a sense of loyalty to her heritage, yet she wasn’t as connected to it as she wished. 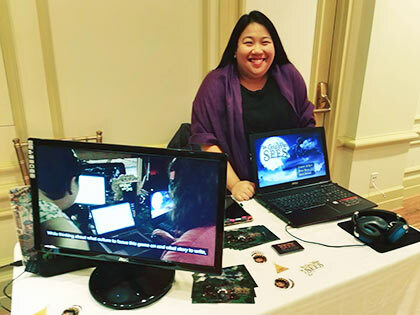 Now, armed with an MA in International Communication with a concentration in Technology in International Education and aware of the fact that there are currently no video games focused explicitly on Filipino culture, Pattie is spearheading the development of The Girl Who Sees, a 2D point-and-click adventure role-playing game that aims to showcase Filipino history and culture. 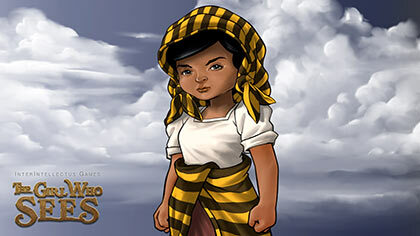 Set in the Japanese occupation during World War II, the game sees a young village girl, Quina Laban, helping a duwende named Edgar to translate a mysterious ancient scroll sought by evil creatures, in the hopes that uncovering its secrets would explain why she suddenly gains the power to see Tagalog words everywhere she turns. Players will embark on quests to help the magical forest, fight mythical creatures, and learn Tagalog vocabulary while they’re at it. With The Girl Who Sees still under development, interested backers may support the project through its Indiegogo crowdfunding campaign. Below, Pattie tells us how her Filipino-American upbringing paved the way for the creation of The Girl Who Sees, and what she hopes to impart to Filipino players, especially those who find themselves miles away from their homeland. I was born in Chicago, but my family moved out to the northwest suburbs when I was a baby. I am the only child of a single mother, but I grew up surrounded by my mom’s large extended family. My family has attended a Filipino Presbyterian church since before I was born, so I definitely grew up with a strong sense of Filipino heritage. My mother’s family is from Cotabato, and my Lola Ophelia’s experiences during WWII were actually what inspired the game’s setting. How in touch with your Filipino identity are you, considering that you were born and raised in the U.S.? Through Filipiniana celebrations and cultural dances, I did have a healthy exposure to the Filipino arts growing up. Like many Filipino-Americans, I was not taught Tagalog or spoken to in Tagalog at home. The adults in my family spoke Tagalog to each other, but not to the kids. I have worked hard to achieve what could be called a conversational grasp of Tagalog, which was pursued by actively listening to the adults speaking in Tagalog and asking them when I didn’t know how to say something. The frustration that I’ve heard voiced by my peers at their inability to speak Tagalog properly is what led me to include some Tagalog language-learning in The Girl Who Sees. I have had many opportunities to reflect upon my Filipino heritage and identity because of living in Manila, going to a Filipino church, and actively participating in Filipino cultural clubs in high school. When I left home for the east coast to attend Brown University, it was my strong and fast attraction to Brown’s Filipino Alliance that helped me to realize I strongly associate my Filipino identity with that sense of unconditional belonging and support. 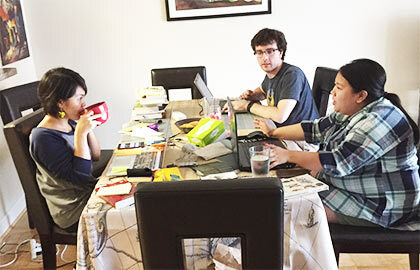 We all took an earnest interest in each other despite the fact that we were studying different disciplines and hailed from all over the U.S. We became that reminder of “Filipino home” for each other. As a Filipino-American, what have you noticed about Filipinos’ relationship with their roots? How does colonial mentality factor into the way they regard their Filipino identities? This is a hard subject to broach without stepping on anyone’s toes, but I will do the best I can. Filipinos tend to downplay their presence because assimilation is the surest way to comfort and success in a new place. Colonial mentality has taught Filipinos to defer, and so they defer to the dominant culture that surrounds them. In effect, this devalues a Filipino’s sense of self-worth. Filipino-Americans who have grown up in the U.S. have begun to break this pattern. I could joke that you can blame our large American egos, but in reality, we recognize that we deserve as much of a voice as any of our fellow Americans. What inspired you to create The Girl Who Sees? The moment I knew that a game showcasing Filipino culture had to be made was when I found that there weren’t many games that were set in the Philippines and that none of them were of an educational nature to showcase Filipino culture. I go into detail on this in a blog post on the game’s website. How much research did you have to do for the game, as someone who did not grow up in the Philippines? The topic that we’ve had to research the most has been ancient Philippine mythology and lore. We’ve also visited the U.S. National Archives here in our area to view their artifacts and records from the Philippines during WWII. I’ve familiarized myself with some literature on the subject. I’ve been reading Filipino comics and watching Filipino horror. The team behind The Girl Who Sees includes members who are not Filipino. Was it hard or easy to get them on board the project, seeing as you’re all doing it pro bono? 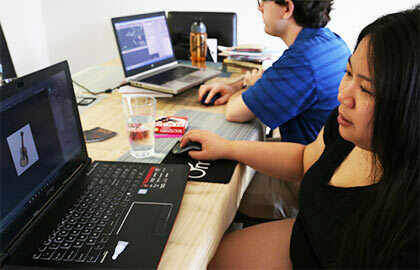 Our non-Filipino team members have been willing from the start to support the creation of a game about Filipino culture. As diversity is a big focal point in American society, many Americans recognize that our various ethnic heritage and cultures are important to learn about. What is the status of the project at the moment? When and on what platforms can users expect it? We are currently running a crowdfunding campaign on Indiegogo until November 30, 2017. We are developing the game for PC and Mac. 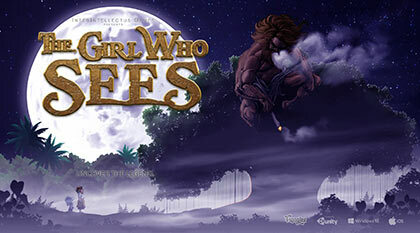 We plan on using all funds raised towards building the full version of The Girl Who Sees. We need these funds to develop the game, market it, and distribute it. Indiegogo supporters have the opportunity to pre-order the game now. People who pre-order will also likely have the option to help us playtest throughout development. We’re hoping that the full game will be released around Christmas 2018. What learnings and insights do you hope to impart to Filipinos and non-Filipinos when they play The Girl Who Sees? ­Given that the Filipino diaspora today is enormous and spread out across the world, I want to help ensure that there are opportunities for young Filipinos around the world to engage with our culture in a fun, interactive way. There are millions of Filipinos spread across the world far from their homeland, and thus far from their primary source of cultural knowledge, expression, and lore. When Filipinos move abroad with their families, many are unsure of how to impart their native culture to their kids, especially when their kids are surrounded by the alluring hegemon that is U.S. mainstream culture. While many Filipino-Americans are able to explore their cultural heritage and knowledge through school social clubs, these groups often lack the resources to do deep studies of Philippine culture. The Girl Who Sees is not an educational game per se, but it can certainly serve as a stepping stone to learning. 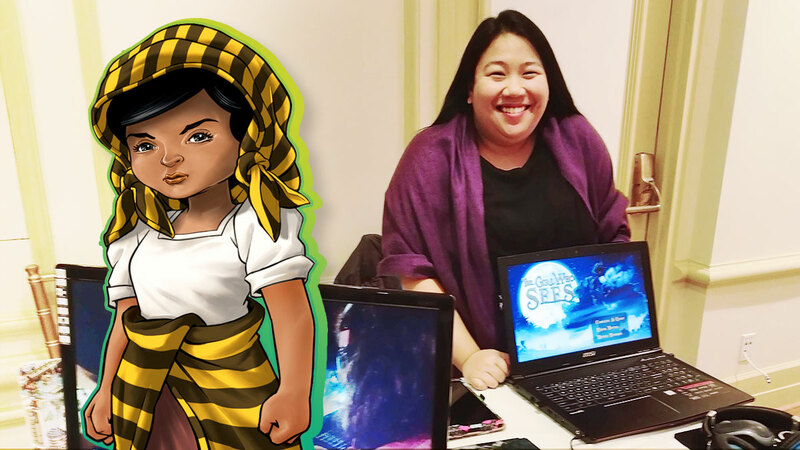 We want this game to serve as a starting point for Filipinos to tell their own stories. Lolos and lolas can play with their apos, and hopefully the apos would then ask about their experiences during WWII and/or growing up in the Philippines. Filipina nannies and caretakers the world over could play this game with their charges, giving them the opportunity to share more about their home and background. This game is an example of how media can be used as a tool to recapture the attention of young Filipinos of the diaspora and reinvigorate their desire to learn their parents’ native tongue, read up on Filipino history, or even plan a trip back to the Philippines.